Stock E36 6-cylinder pipes sound good upon start-up and idle but raspy under acceleration, and create a strong resonance - mainly for back seat passengers - at certain throttle positions. 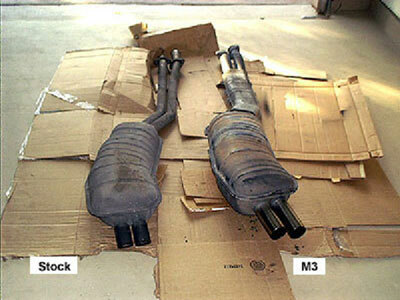 Installing an M3 exhaust will make the engine sound smooth and quiet throughout the throttle range. It's especially quieter upon start and idle, and very smooth under throttle. The pipes are larger in diameter than stock, but shrink down at the junction for a direct bolt-on fit. There's tight clearance between the heat shield on the M3 pipe and the rear sway bar. My overall impression is that this is a good mod for those who want a smooth	and subtle sound without the annoying loudness of other aftermarket pipes. The procedure for exhaust replacement is documented in the Bentley and Haynes manuals and is quite easy to do. Most importantly, support the car with jack stands positioned under the car body. DO NOT rely on the jack alone. I used two jack stands (one under each side) and the tire jack as backup. 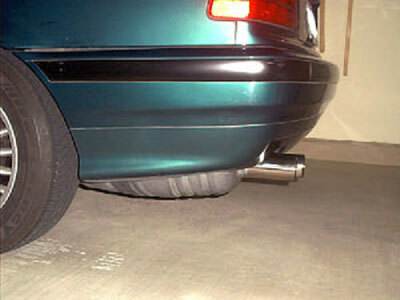 You may want to use some oil to help loosen the exhaust bolts, since they will be dry and on tight. Make sure your car has cooled down before handling any exhaust parts, too. A helper would be nice to position the exhaust while you bolt it on. I supported the back half of the exhaust with a jack stand, holding it in position while working the bolts.